The Bold and the Beautiful (B&B) spoilers tease that fans could be in for a real shock. 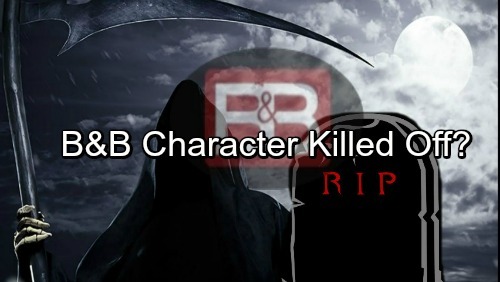 Nothing’s been confirmed yet, but there’s B&B buzz out there about a character being killed off. That strategy would make a lot of sense. B&B needs something to jumpstart the drama and propel some new stories. A stunning death is certainly one way to do that. The competition is fierce among the soaps right now. Many viewers have enjoyed the fallout of Bill (Don Diamont) and Steffy’s (Jacqueline MacInnes Wood) hookup, but that’s winding down. The Bold and the Beautiful spoilers say we’ll see a few more reactions, but what happens after that? They could use a death to deliver something exciting again. If someone ends up dying on the CBS soap, a couple of options immediately come to mind. The first one is Sheila (Kimberlin Brown). B&B fans loved when she showed up out of the blue and caused chaos for Quinn (Rena Sofer), but there aren’t many places left to go with that. With soaps, you always have to keep the stories moving forward and spinning off in different directions. The Bold and the Beautiful could send Sheila out with a bang by including one final scheme. It could backfire spectacularly and result in her death. Then again, perhaps B&B could go with a murder mystery. Several suspects could emerge, but Quinn would undoubtedly be accused. Eric (John McCook) might have his work cut out for him as he tries to prove his wife is innocent. However, we can’t rule out other death candidates. Things aren’t looking good for Sally (Courtney Hope) now that Hope’s (Annika Noelle) back. Does Sally really have a shot at winning Liam’s (Scott Clifton) heart? It doesn’t seem likely when Hope and Steffy are around. Liam and Hope have a lengthy history to draw from. Steffy is carrying Liam’s child, so that’s something that can work in her favor. The Bold and the Beautiful spoilers say Sally will rev up her efforts to attract Liam. She may grow increasingly desperate. How far will Sally go to achieve her goal? B&B could take the crazy stalker route and ultimately kill Sally off. That’d be an interesting end to her storyline. Of course, we could see a minor character bite the dust instead. Shirley (Patrika Darbo), Saul (Alex Wyse) and Darlita (Danube Hermosillo) might be options in that case. Regardless, a death of some sort would definitely shake up B&B! We’ll give you updates as other news comes in. Stay tuned and don’t forget to check CDL often for the latest Bold and the Beautiful spoilers, updates and news.